Clarkson is senior fellow at Political Research Associates, a progressive think tank in Somerville, Massachusetts. He said today: “Roy Moore is the most openly theocratic politician in national life — and he has a good chance of being the next U.S. Senator from Alabama. “The special election to fill the remainder of the term of Jeff Sessions, who was appointed as U.S. Attorney General by president Trump, will be held on Dec. 12. Moore is heavily favored to prevail over Democrat and former federal prosecutor Doug Jones. 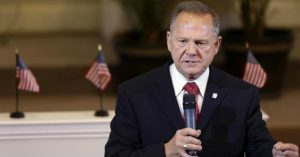 “Moore favors criminalizing abortion and homosexuality. He does not respect the authority of the U.S. Supreme Court to interpret the Constitution, and the federal courts to enforce civil rights laws. His views hark back to the time of massive resistance to civil rights for African Americans, when opponents invoked the notions of nullification and interposition — which basically meant that states could ignore federal actions; including court orders they believed were inconsistent with the Constitution. “Like the nullificationists of the last century, Moore does not view the rulings of the U.S. Supreme Court and the federal courts as binding on the states. Particularly if they conflict with his idiosyncratic view of what God requires. “Roy Moore epitomizes the contemporary politics of theocratic Christian dominionism in his attacks on separation of church and state and religious freedom. Clarkson is author of the 2016 report “When Exemption is the Rule: The Religious Freedom Strategy of the Christian Right.” He also wrote the book Eternal Hostility: The Struggle Between Theocracy and Democracy.